Pomegranate season seems like it’s been gone for far too long. With so many varieties of berries readily available during the hot months, it’s been getting hard to keep that delicious fruit off of my mind. It wasn’t long before I started to wonder if anyone is brewing with it. With the warm weather and pomegranate’s natural sweetness and slight tartness, a saison balancing refreshment with savory acidity and tartness seemed like a very good idea indeed. My searching turned up few examples of commercial pomegranate beers, let alone in this particular style. He’Brew makes a pomegranate ale called Origin, while Fort Collins Brewery and Saranac both made pomegranate wheat ales at some point. That was all I could find. 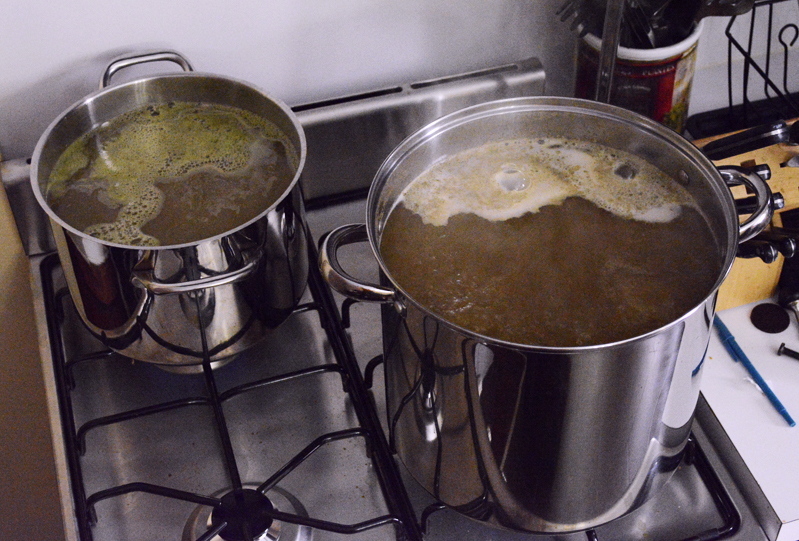 Nonetheless, I was undaunted, as it seemed like a rarely explored region in the homebrew community as well. There was very little (though enough) talk on forums for me to feel confident in putting together a recipe. One of the most interesting suggestions was that rather than using whole pomegranates (difficult to obtain right now, and they would prove quite tedious besides) or pomegranate juice, to look for pomegranate molasses in a Middle Eastern market. Pomegranate molasses is apparently an ingredient of wonderful possibilities in cooking, and I can only hope it proves as viable in brewing. Wyeast 3711 is well-known for eating the plate the meal was served on, so I’m hoping the Munich and carapils will help prevent the body from becoming too thin. I’ve read that the pomegranate gets quite tart when it ferments out (all the sugar having vanished), so body will be important to keep the beer from being too aggressive. Fortunately the yeast also imparts body as it goes along, so I’m not expecting this to become an issue. I’m also hoping to bolster the dark fruitiness of the beer with the healthy helping of Strisslespalt hops, which are known for berry-like flavors. This was my first brew with my mash tun, which was new, exciting, and fun. I still have to work out some kinks in my process, but it seemed like brewing went much more smoothly than in the past even when wrestling with hitting my mash temp, low efficiency, and wort split between two kettles. Having a much larger space to work in complete with more tables space for gear is incredibly helpful. In the end, except for forgetting Whirfloc, I did pretty well. I ended up with five gallons of 1.053 wort chilled to 68 degrees into which I pitched a cold crashed starter. I was shooting for 1.049, and was surprised to find myself over given falling short of my preboil gravity by 4 points. However, since the pomegranate molasses probably contains soluble compounds other than sugars, it’s possible that the gravity is not truly quite so high. It seems that now, just a few hours later, the yeast is already gettin’ a’gobblin’. Being my first all grain/mash-tun brew as well as my first brew in this space, I’ve already got a few ideas for improvement. While going for two kettles and chilling the wort in the bath worked reasonably well, this stove puts out so much heat that I think it’s getting close to time to upgrade the kettle and put together an immersion chiller. But first, I need a quick-reading thermometer to get my mash more reliable. UPDATE (8/17/13): At two weeks there hasn’t been any visible signs of fermentation for quite awhile. I just took a gravity sample and found it has come down to 1.002, but still has plenty of body. It is very lightly tart, subtly enough that I could be imagining it. It has pleasing fruity aromas and flavors, but nothing that I could pin down as pomegranate. I was concerned that the pomegranate might not come through fully enough, so I’ll also be priming using pomegranate molasses to see if I can push the fruit a bit further forward. This entry was posted in beer, brew day, equipment, recipes and tagged fermentation, fruit beer, saison on August 5, 2013 by Dylan Bargteil.